This time around, we’ll be doing things a bit differently as we follow these houses through to their completion. Rather than focusing on each home individually, we’ll be moving through the stages of both houses together. We decided on this format for a few reasons. Firstly, the homes in question are similar in a lot of ways. Both will be dreamy vacation homes for our clients - two warm, outdoorsy families, both with the eventual dream to someday retire in ‘The County’. Both are new builds, with wood framing, great amounts of insulation, high quality windows, air tight envelopes and high efficiency systems. And, what’s most interesting, both houses are being built by the same builder! It’s always a pleasure working with Mike McGonegal of Reeves Fine Homes, so we’re more than happy to be doing it twice over. Now let’s meet these houses and their lovely families! 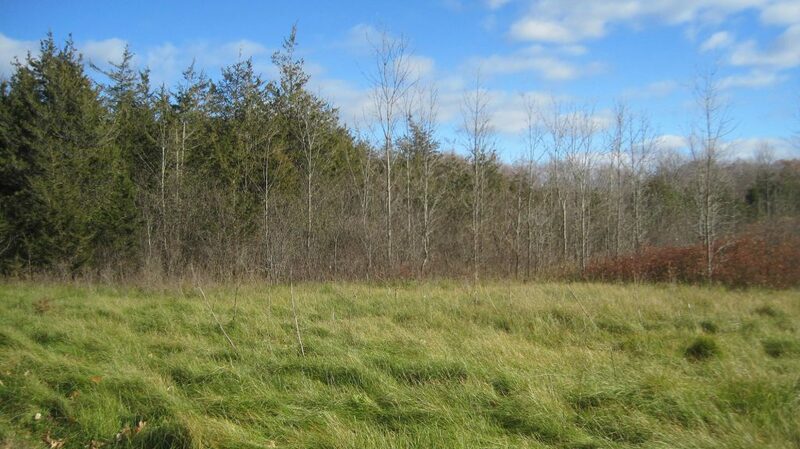 This house is located on a lake front property among the cornfields and grassy fields near Wapoos in Prince Edward County. 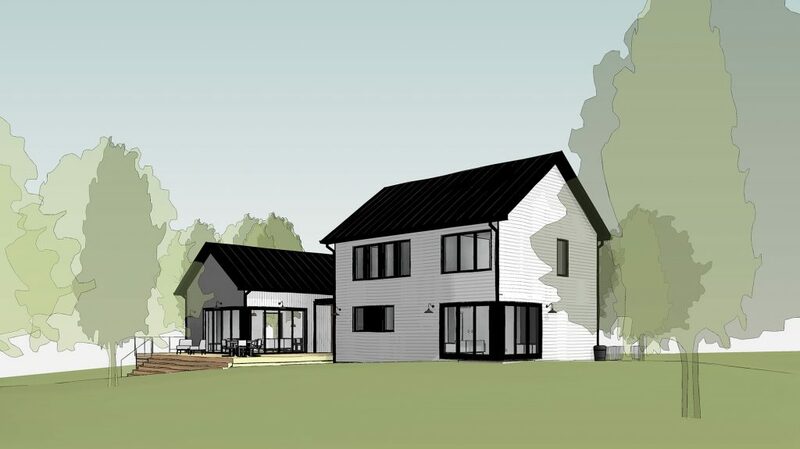 The family, a couple with two young children, are planning their dream vacation home and potential retirement haven. But for right now, however, they hope to call their new house home for annual holidays and weekend retreats, with plenty of communal space both indoors and outdoors where the kids, dogs, and parents can enjoy each other's company. The wife is an avid cook with a love of yoga, entertaining, and a great cup of coffee in the morning. With a an appreciation for the little things and a positive outlook on live, she dreams of a home where she can cook dinner in a spacious kitchen while looking out on her two children playing in the open concept living room within sight. As she loves to cook, a huge kitchen and open concept dining area is also a must, with the ability to seat 16-18 people on those special occasions. The husband, outdoorsy, active, and family oriented just like his lovely partner, is looking for a durable and cozy home. Pretension and glitz have no place in his dream home. Instead, he hopes for an easy to maintain home with simple, high quality materials. We’re looking to build a home that reflects the family's personality - warm, breezy, communal, with lots of light and a hint of chic minimalism and effortless beauty. 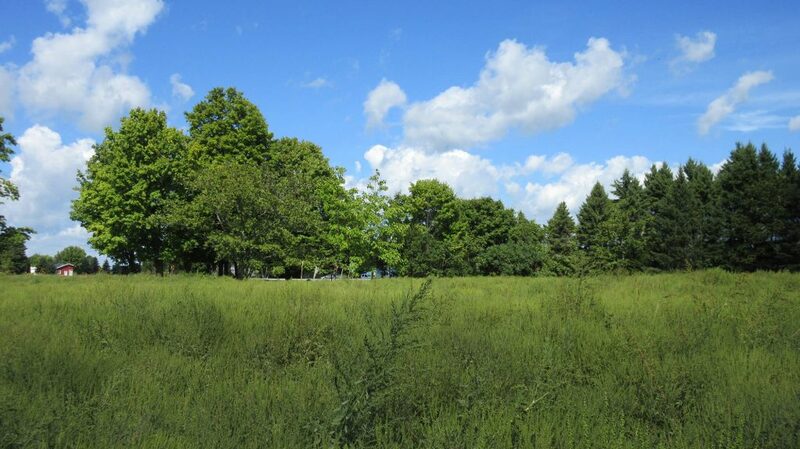 Milford House is also located in picturesque Prince Edward County, surrounded by meandering trails and cedar trees. 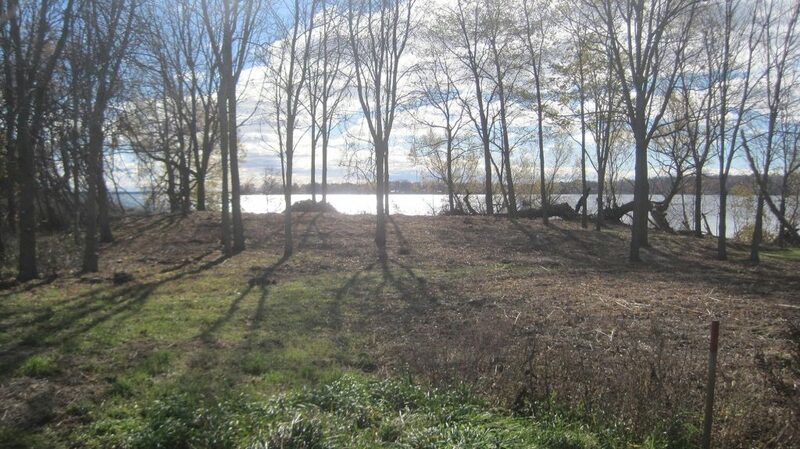 The property is not waterfront, which is somewhat rare in Prince Edward County. 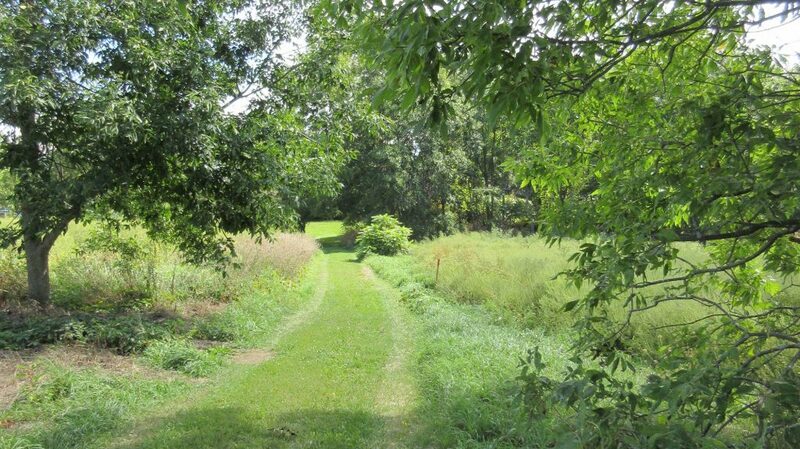 Instead, the property is pastoral, with lush tall grasses and soft, rolling hills. The family, a couple with two grown-up children, three large dogs, and two cats, is also looking for a warm, welcoming space to enjoy each other’s company and the great outdoors. The couple, who live in downtown Toronto, dream of a relaxing space where they can enjoy peace and serenity on their long trips to the home year-round. 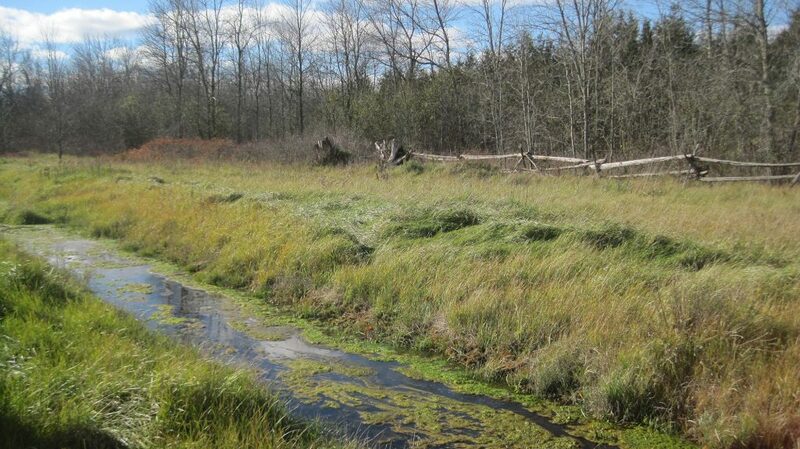 The wife loves outdoor activities like cross country skiing, hiking, and canoeing and swimming. As the executive director of a small non-profit, she has a penchant for social justice and wants her home to reflect her strong social conscience. 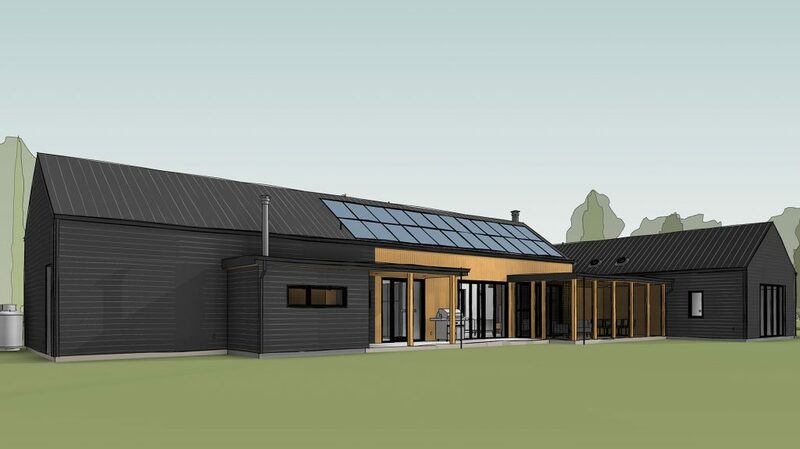 With a love of organic farming and gardening, an extremely energy efficient home with a large property for sustainable gardening sounds like just the thing for her. The husband, outdoorsy like his wife, has a preference for a rustic farmhouse aesthetic, with wooden accents and tall cathedral ceilings. His dream home includes an open concept great room, enough space to entertain and host visitors (which they plan on doing a few times a month), and a fireplace or wood burning stove. His interests are humble and straightforward: a warm meal, a good book, watching the game, a full night’s sleep… in short, quality R&R! 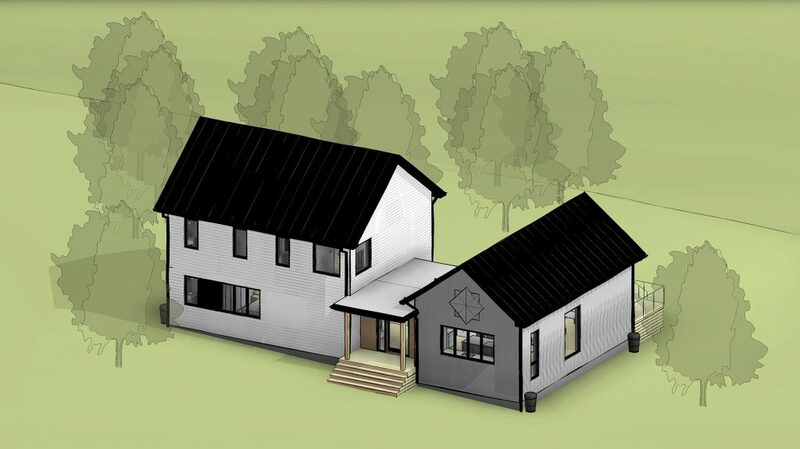 Both of these homes will be lovely, warm, and inviting, with modern amenities, durable materials, and easy to maintain appliances and fixtures. 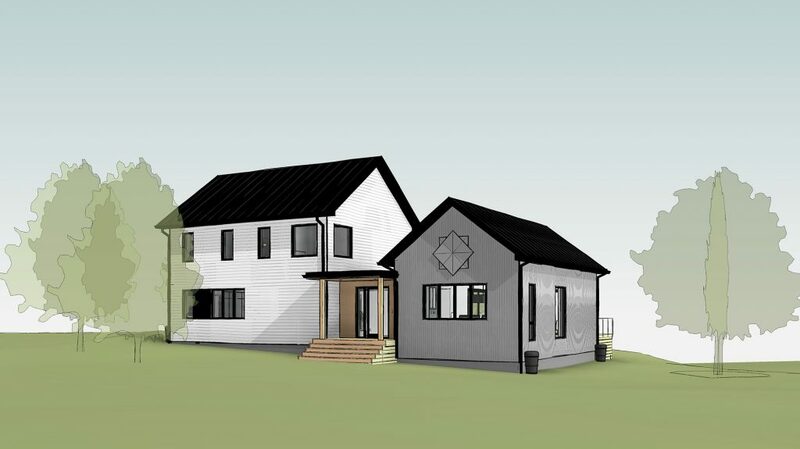 We’ll be following both these homes through each stage of building, until finally our hard work pays off and we get to see the finished products. 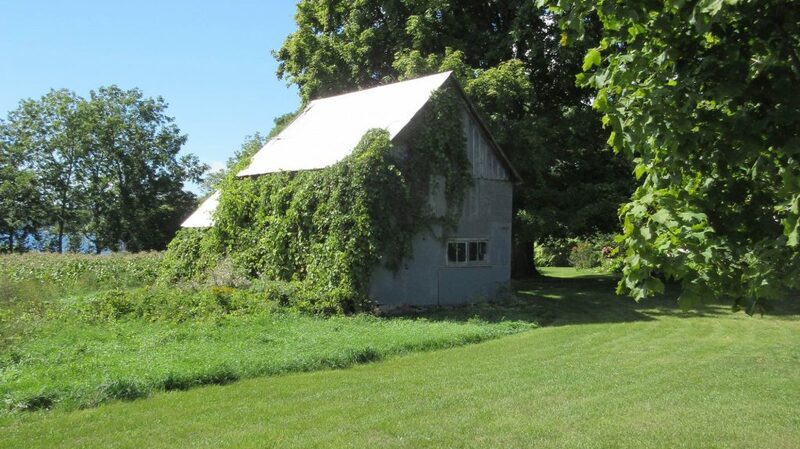 Keep an eye out here, on our website, as we share more and more about these two gorgeous rural homes. If we’re lucky, we know what our hopes, dreams, interests and affinities are. But what do those preferences look like? How do these preferences translate into physical surroundings? Some translations are easy: an avid cook wants a beautiful kitchen, a teenager wants a private retreat, and a drummer needs soundproofing. But other preferences are a little harder to put into material forms than others. Plus, what happens when a family isn’t done growing? Their preferences and priorities may change through the years. 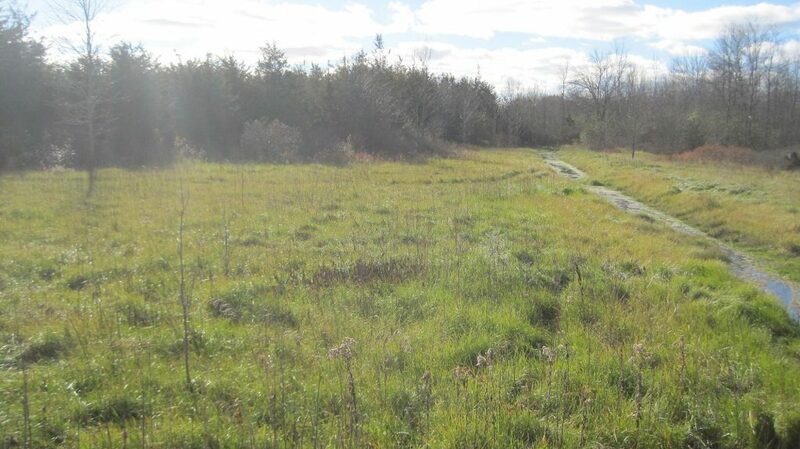 This is where the design of a Solares dream house comes into play. Sure, many have aesthetic preferences and personal “must-haves” when it comes to their dream home. But much of the time, we are the ones who translate our clients’ values and interests – and even their future interests - into walls, a roof, and most importantly, a floor plan. 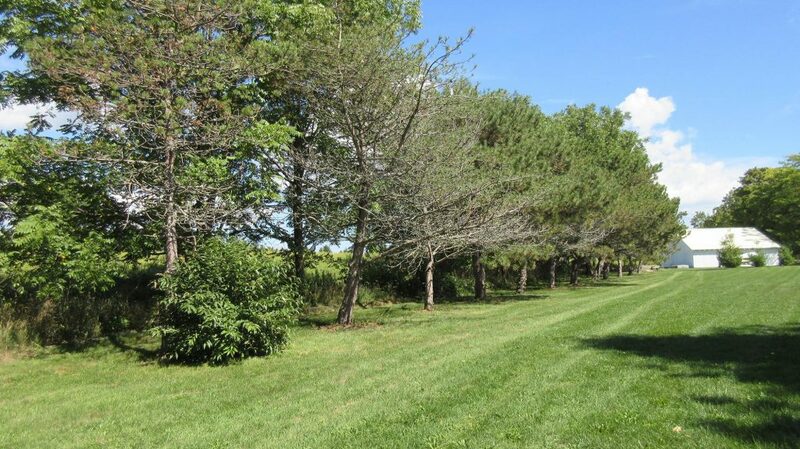 So without further ado, let’s talk about our two Prince Edward County homes and how we tried to match their floor plans to their unique and lovely residents. This home, for our outdoorsy clients with two young daughters, needed to be able to grow with the family as their needs expand and change with time. The home needed flexibility, airiness, and open access to the landscape, especially the picturesque eastern lake view. So we decided to build the house right by the water, for that lovely and indulgent vacation-home look and feel. The home’s “modern farmhouse” aesthetic was partly due to our clients’ taste for tall ceilings, eclectic yet elegant materials, and large airy spaces. The floor plan is set in a rough H shape. On one branch of the H sits all the home’s public space. The other branch is where the private and semi-private spaces reside. And bridging the two branches is an entryway with exterior doors, which connects and separates the two main areas of the home. The front porch opens into a foyer, in the centre of the “H”. Directly opposite the front door, the large back door opens onto the home’s spacious rear deck, which stretches beyond the great room. The rear deck has a set of wide stairs that lead down towards the lake. On the more communal side of the home, adjacent to the foyer, sits the Great Room, with airy 10ft high ceilings and large windows that look onto the beautiful property to the south, north, and west. The open concept kitchen includes a kitchen island where the kids can sit and play while the parents make dinner. A show-stopping fireplace sits in the large living area, creating an intimate and peaceful space for the family to enjoy each other’s company. In the southeast corner, two large sliding doors open onto the porch, creating a seamless opening to the outdoors. 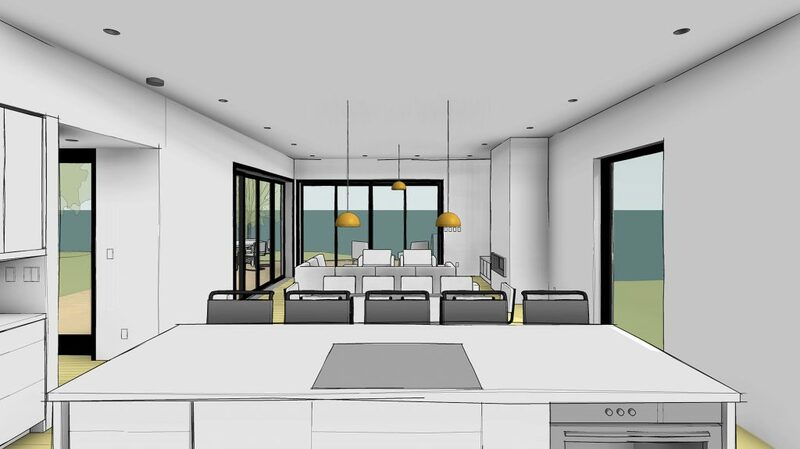 The dining area sits in the centre of the Great Room, and will act as a hub of activity for the family, even as the kids grow up. The space is perfect for eating, reading, and crafting with the kids. Years from now, homework, exam prep, and candlelit dinners could all be great uses of the space. On the other side of the foyer sits the more private wing of the house. Directly adjacent the foyer is a large laundry room with extra coat storage. 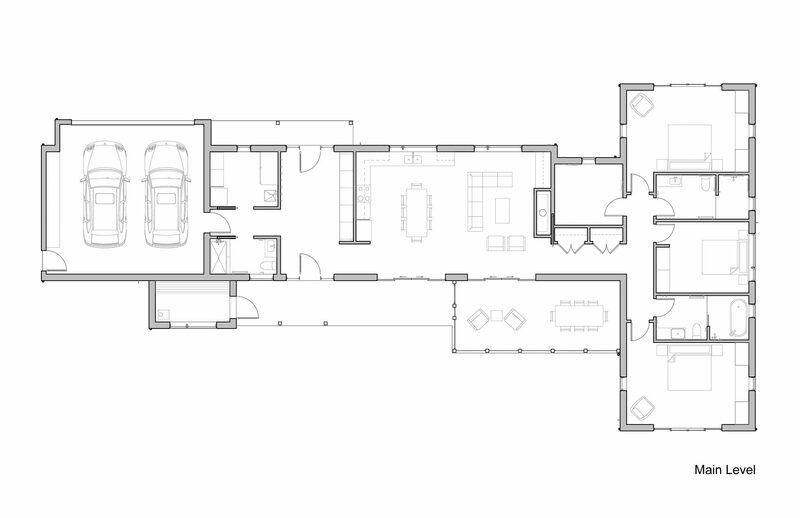 Alongside the laundry room sits a bathroom, a play room, and a guest suite for visitors. The play room is designed to easily transform into a private study or additional bedroom, as the family changes and the kids grow up. An additional powder room near the foyer adds a bit more formality to the space. 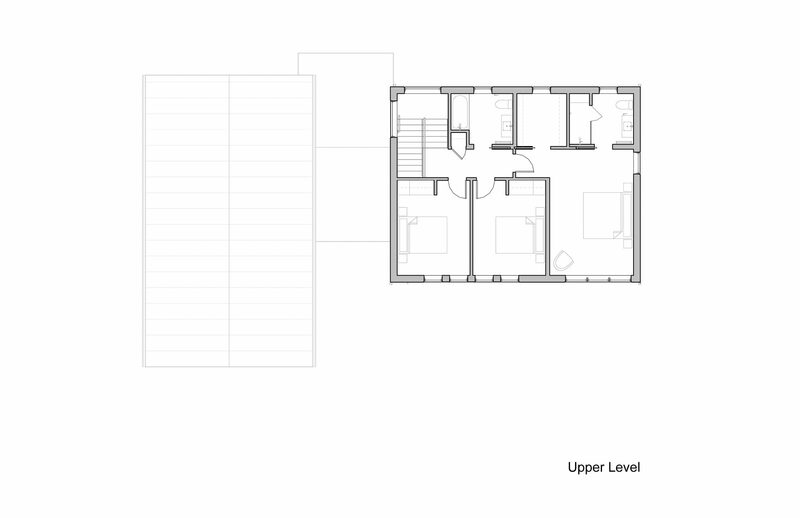 The second story is a private space, just for the nuclear family of four. The kids’ bedrooms come first, opposite a full bath that we’re sure they will completely take over as the years go on! 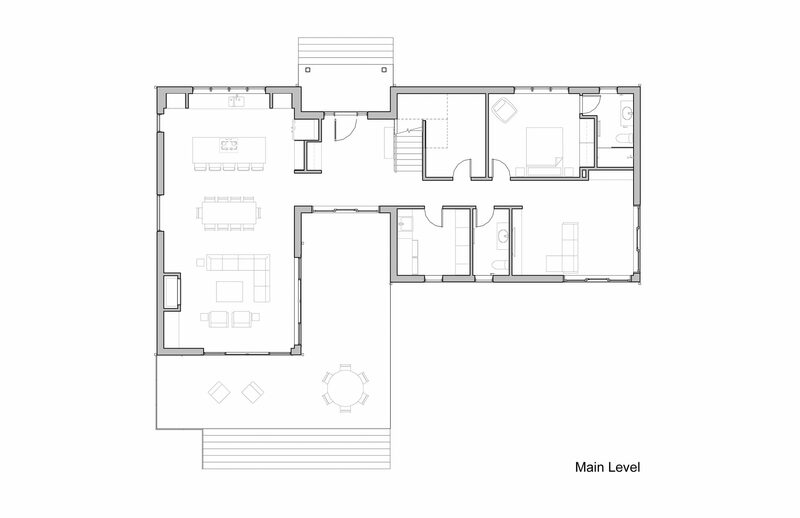 The master bedroom with an ensuite bathroom is tucked into the far corner, furthest from the stairs, to create a little more additional privacy for the parents. Milford House, for our clients with two grown-up children, was designed to cater to their outdoorsy personalities, their lovely dogs, and their love of entertaining. We ensured that the single-storey floor plan was designed with aging-in place and accessibility in mind, so the couple can continue to enjoy the house for decades to come. The home is cozy and intimate, sitting just one storey high and nestled among the property’s lush trees. Since our clients are avid nature-lovers, we made sure the house didn’t overpower the surrounding landscape, but instead fit itself perfectly among the lush grass and trees, as though it had always been there. This house is not here to “conquer” nature – it’s here to complement it. The house has a whopping three porches, for a total of almost 500 sq.ft. of outdoor space. Two of the porches flank the home’s central foyer, so people can enter the house from the front or the back to the same location. The foyer includes huge amounts of closet space, perfect for storing the couple’s plentiful outdoor clothing and equipment. On one side of the foyer sits a powder room and a large laundry room. The powder room takes “custom home” to a whole new level, with a shower designed specifically for washing the couple’s dogs after long rambles through the property. The enclosed garage is located at one end of the house, beyond the bathroom and laundry room, and can be entered through a hallway off the entryway. The spacious Great Room stretches out beyond the entranceway. The kitchen, with tons of counter space and storage, wraps around the house’s dining area. We wanted to create less formal separation between cooking and dining, which creates a perfect dinner party environment. That way, the hosts can interact with their guests throughout the whole night, rather than retreat into the kitchen for frantic plating and dishwashing. 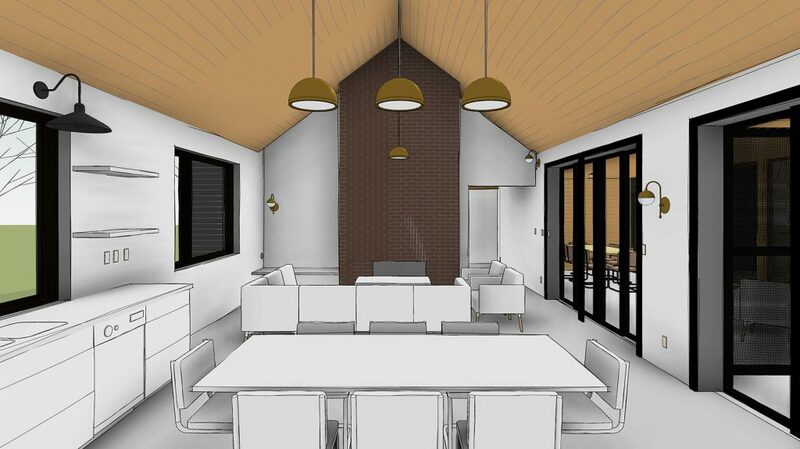 The Great Room also includes gorgeous vaulted ceilings and a huge brick-clad fireplace. The more private wing of the house sits past the Great. This wing can be easily partitioned from the rest of the house by closing a pocket door. This will be especially helpful if the dogs need to be contained, or if someone wants to retire from the Great Room and head to bed early. The bedroom wing includes two guest bedrooms, two bathrooms, and the master bedroom. 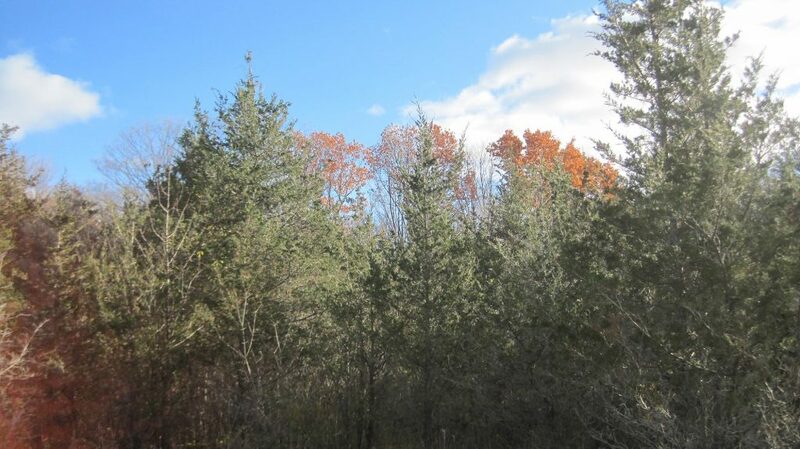 Both these homes appeal to our clients’ outdoorsy and family-oriented characteristics. We’re excited to see these families settled in their beautiful new country havens. 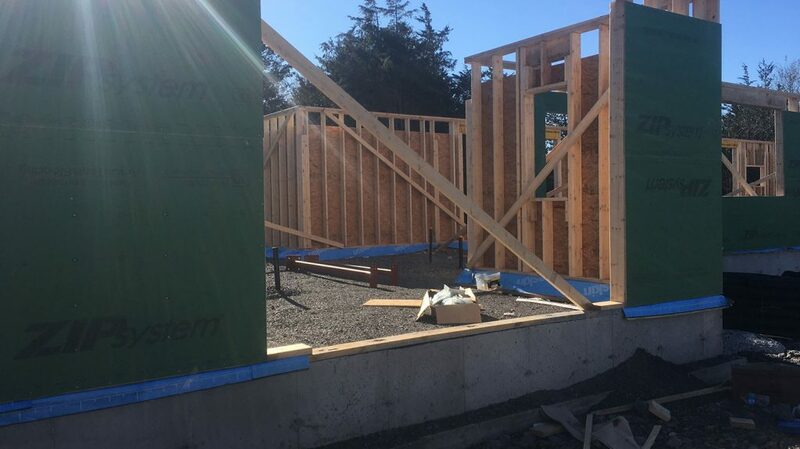 Keep posted while we go over the home’s building structure, envelope, systems, and finally, the big reveal! 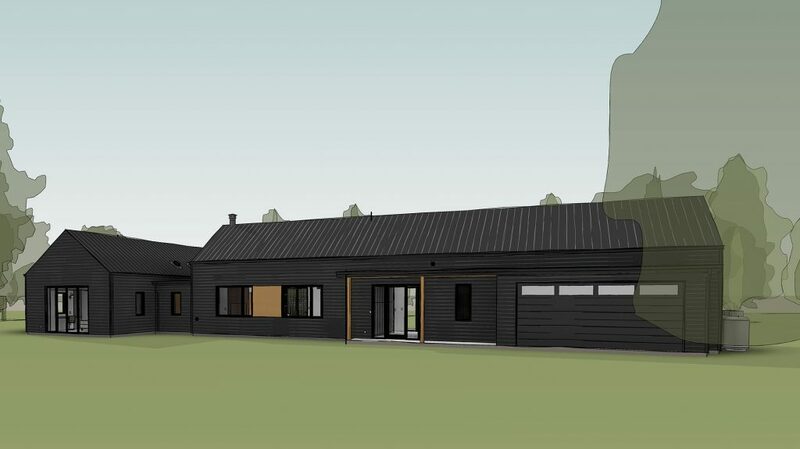 When it comes to structure, these two rural homes are nearly identical. Because why mess with a good thing? 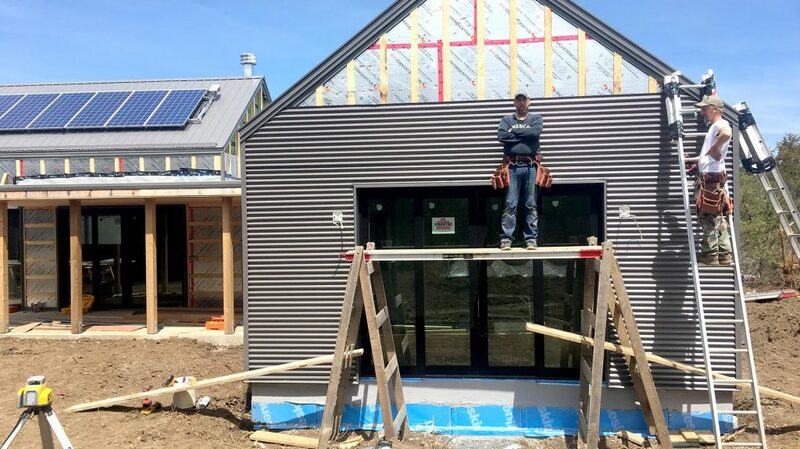 We, along with our builder Mike McGonegal, know what we like and stick with it: innovative and high quality materials, incredibly efficient systems, and clean modern finishes. Smith’s Bay House and Millford House both tick all of the boxes on our checklist. So , let’s go over what makes these homes stand tall! Both homes are composed of a fairly conventional 2x6 wood stud frame, with poured concrete foundation walls and a slab on grade. Neither home has a basement, for different reasons. Smith’s Bay House is located on a property with a high water table, and Millford’s low-lying age-in-place structure and high limestone bedrock leave little room for basement ceilings. But, with a custom floor-plan, any perks of a basement (like a family room, entertainment system, or added guest bedrooms and private areas), can simply be added to the main areas of the house, instead of exiled underground. 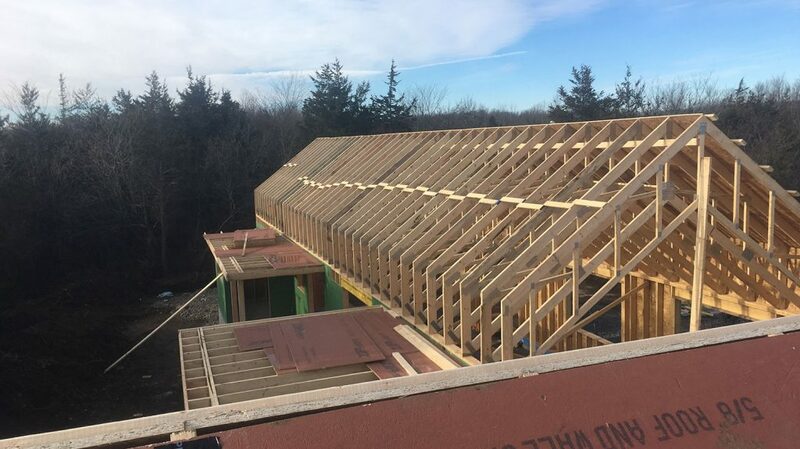 The homes both use engineered roof trusses, which we’ve used in previous projects, like our Credit River House. 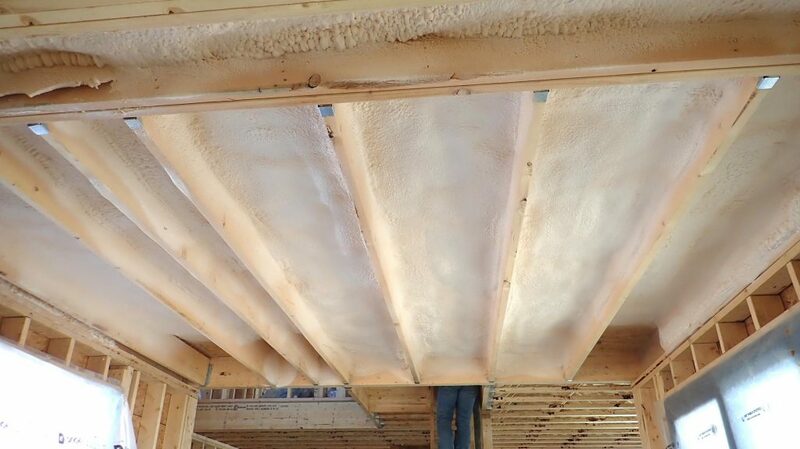 Where joists lay flat, trusses are 3-dimensional, which makes them incredibly sturdy and able to be filled more efficiently with insulation between members. As for the rest of the structure, we used ZIP System Wall Sheathing, which you may remember us praising in our Frontenac House Case Study. We love ZIP System Wall Sheathing for its multi-tasking abilities, its quick installation process, and its structural durability. 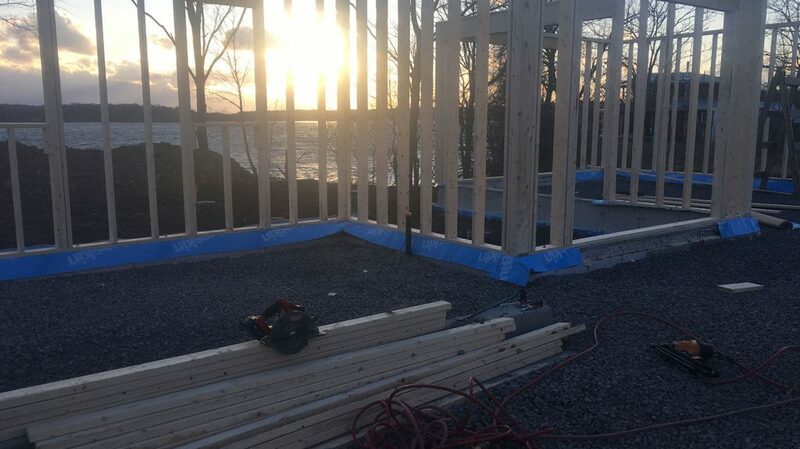 Made by Huber Engineered Woods, ZIP System sheathing is a plywood sheathing covered by an airtight rubberized coating and a built-in vapour permeable water barrier. 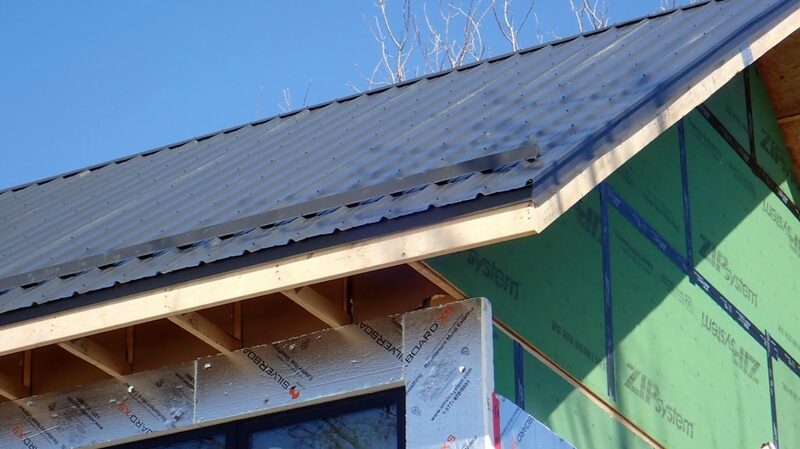 In layman’s term: this sheathing not only acts as the home’s main bracing, but it also acts as an air barrier, keeping the home airtight, and a moisture barrier, keeping the rain and humidity out. Plus, ZIP System Sheathing is delivered in standard sheet sizes that simply need to be taped together. Quick, easy, and efficient - what’s not to love about ZIP System sheathing? 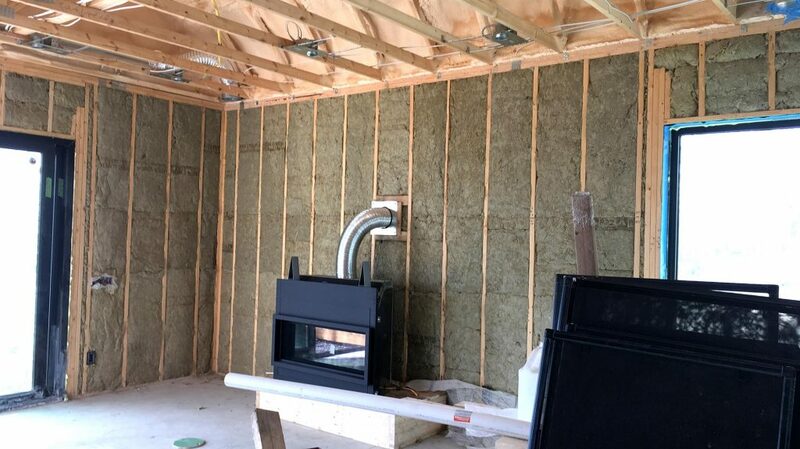 Next, we’ll be talking about the home’s envelope - the insulation and air and water protection that wraps the home’s structure. 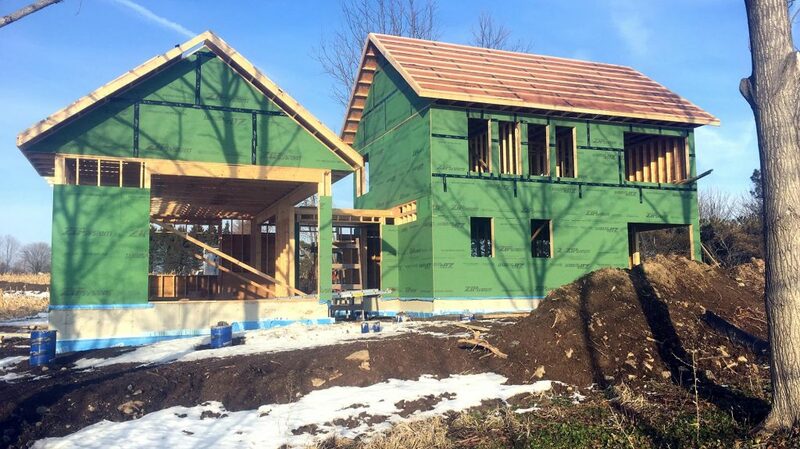 Spoiler alert: ZIP System Wall Sheathing plays a large part in these homes’ envelopes as well! Let’s talk about Building Envelopes! 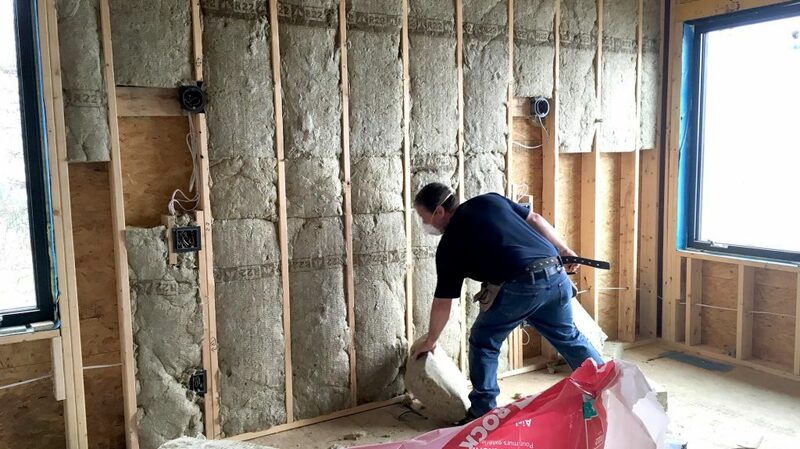 This is where we enclose and insulate the homes with energy-efficient and air-tight assemblies for walls, roof and slab. 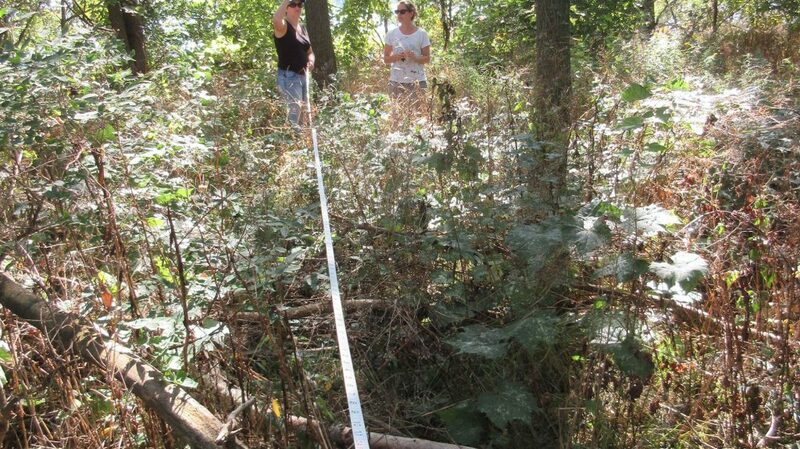 It’s also where we hunt down air leaks, like a bounty hunter on a hot lead! 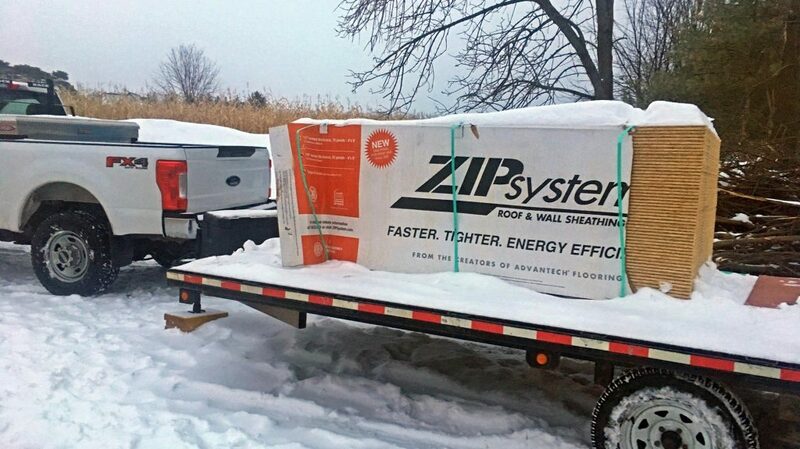 The envelope for both Prince Edward County homes includes 4 inches of under-slab insulation, and innovative ZipWall products in the walls and roofs. 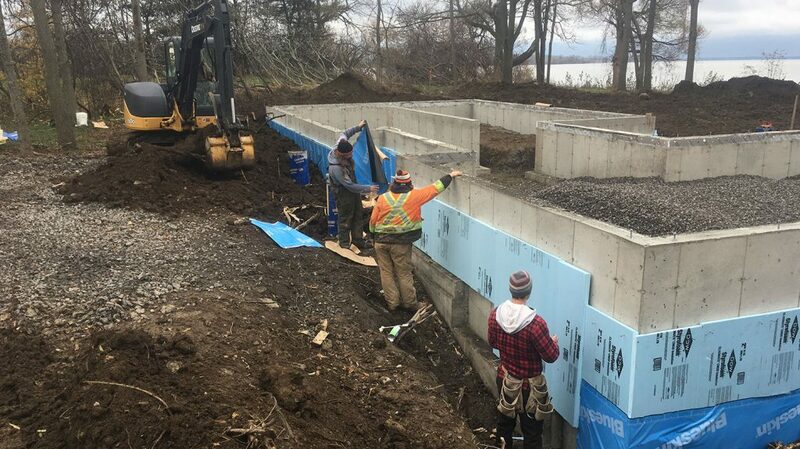 The walls are constructed with ZipWall sheathing, which creates an air tight seal because the seams are sealed with a proprietary tape made by ZipWall. It is so sticky that once it’s applied it will never come off! 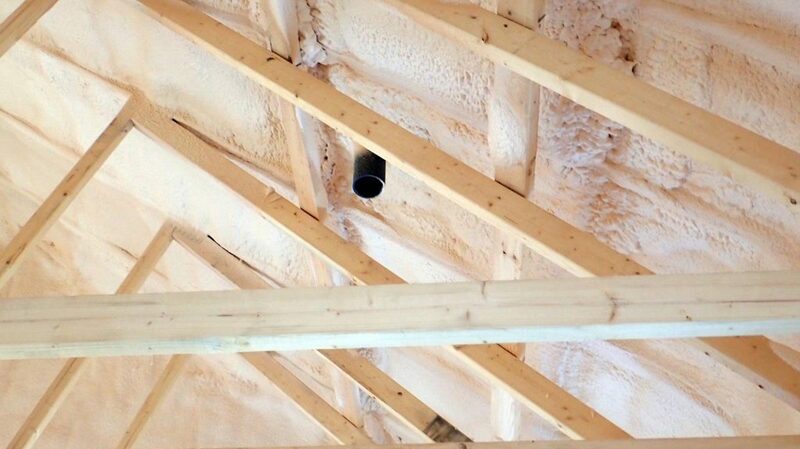 The insulation is 5 ½-inches of mineral wool batting placed between the studs, with polyethylene sheets on the interior face acting as the vapour barrier. Then, we added 3-inch, foil-faced, rigid EPS (expanded polystyrene) sheets on the exterior of the ZipWall. The windows are triple-glazed, fiberglass-frame units by Fibertec, a company located north of Toronto, which are, again, sealed to the ZipSheathing with ZipTape. The roof of Milford house has no overhang, so the connection from wall to roof is also taped. This is typically one of the most vulnerable spots in the air barrier, so being able to tape that corner is critical. We’re also taping and applying a special Zip-brand caulking at the base of the walls where they meet the foundation, and the roof is sprayed to the underside of the ZipSheathing with ten inches of closed-cell polyurethane foam. 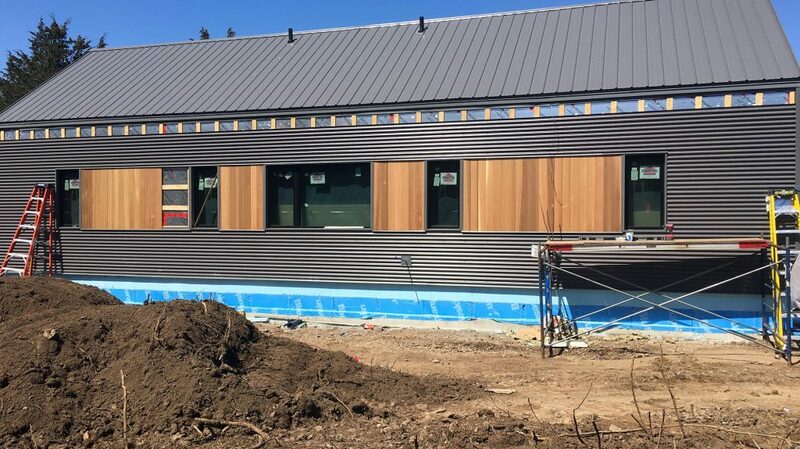 The roof and exterior cladding are sheet steel manufactured in Oakville by VicWest. This steel is made of recycled content, and is extremely durable and long lasting. 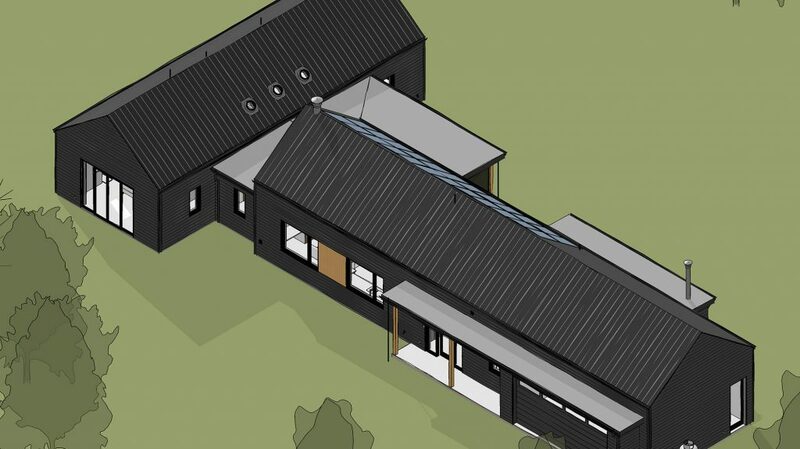 All of this attention to detail is in service to energy efficiency, so we always want to make sure that the envelope is built as air-tight as we designed it to be. To achieve this, we use a fairly new technology (and method) called AeroBarrier. It’s accurate, fast and efficient, with equipment so light and portable that it comes to site on a small trailer. 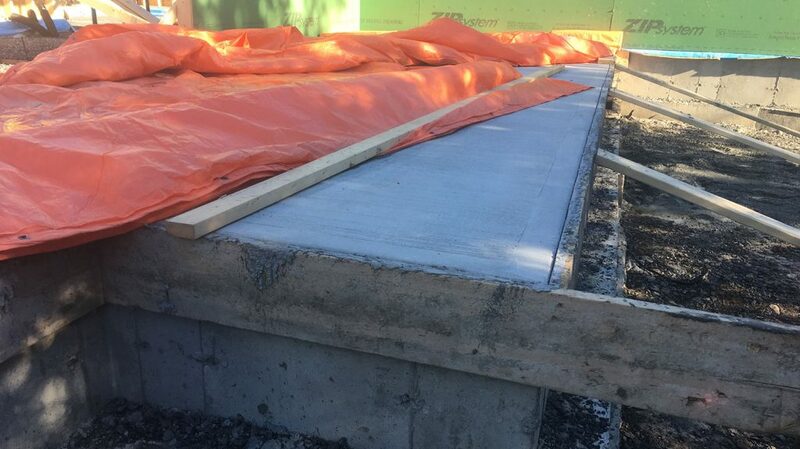 From start to finish, the AeroBarrier air-sealing process takes only 1 to 2 hours. In new construction applications, prep and clean-up time is minimal – typically taking less than an hour. Once set up, the AeroBarrier machine takes over and manages the entire process. 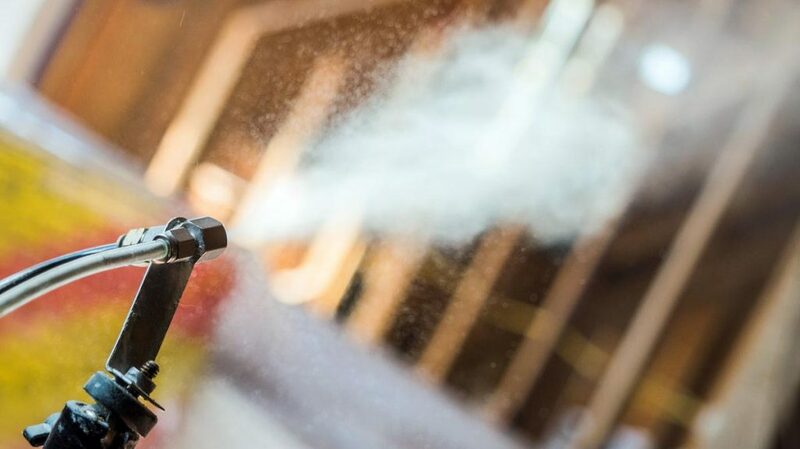 The best part about the AeroBarrier system is that it delivers leakage readings in real-time allowing us to stop the process if necessary and address the issue once the target is hit. This translates to saving time, material and labour. Air Changes per Hour (ACH) is what we’re looking for when hunting down leaks, and the lower the ACH the more air-tight the envelope. The ACH reports for the Millford and Smith homes were stellar. In the Millford house, which is 2,754 square-feet in area and a volume of 27,537 cubic feet, pre-AeroBarrier test results showed an air-leakage rate of 457.2 cubic feet per minute (CFM). That’s like having a 55 square-inch hole in the wall, or having all the air in the house leak out and be replaced by outside air in just one hour (1.0 ACH). Once leaks were identified and sealed, leakage was reduced to 108.2 CFM, which is equivalent to a much smaller 13 square-inch hole or only 0.2 ACH. That’s a 76.3% reduction in envelope leakage! For the Smith home, which is 2,816 square-feet enclosing a volume of 28,157 cubic feet, the AeroBarrier process found a starting leakage rate of 792.5 CFM, which is equivalent to a 95 square-inch hole, or 1.7 ACH. Post AeroBarrier analysis showed 104 CFM of Leakage, equivalent to a 12.5 square-inch hole or 0.2 ACH. We were ecstatic to see this 86.9% reduction in envelope leakage! Both homes ended up at the same very low air leakage rate. Sustainability and efficiency are possible when standards and expectations are set high. Using the best, most responsibly-sourced materials and experts to achieve and analyze results is the way we like to buttress our builds. Next step in the process: the system that will heat and cool these homes. Stay tuned!